This multi-bit screwdriver keeps seven double-ended bits neatly tucked in its ergonomically-shaped handle for easy reaching and storage. An embedded magnet holds a bit for you until you’re ready to insert it. The handle’s shape has dual purpose; it also prevents this tool from rolling out of reach. Very handy and well worth having. 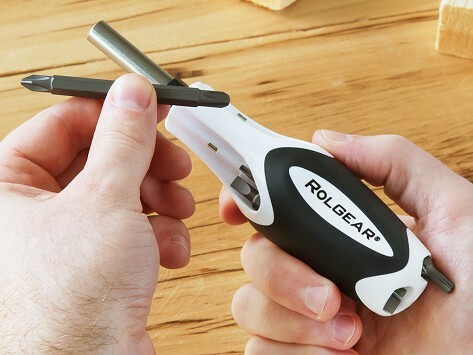 Robert Suter created the Rolgear multi-bit ratchet screwdriver by channeling his own frustrations with available screwdrivers—like often needing two hands when working with one, and using extra force to get to the next gear. He leaned on over 30 years of tool design experience to make a better driver. This first thing you might notice when using this ratchet screwdriver is there are no clicks as it reaches the next gear. This is a good thing—those clicks signal wasted motion. Because Rolgear uses roller-bearing technology, it’s gearless. It has a smooth movement that works faster than some traditional drivers. This saves energy and eliminates lost motion. And the driver can begin to ratchet from any angle, too. Seven double-ended bits store in the handle for easy access while you’re at work. Another smart feature? The triangular-shaped handle means this tool won’t roll out of reach.